The government, through a private financing initiative, is partnering Naza TTDI KL Metropolis Bhd to build the country's largest exhibition and convention centre in Kuala Lumpur. 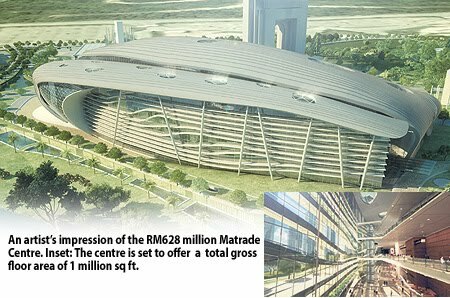 The RM628 million premier convention centre, which will take the shape of a rubber seed, will be known as Matrade Centre, as it will be sited next to the existing Menara Matrade on Jalan Khidmat Usaha, off Jalan Duta. Slated for completion in 2014, the groundbreaking ceremony is expected to take place in the first quarter of next year. A privatisation agreement was signed between the government and Naza TTDI yesterday, witnessed by International Trade and Industry Minister Datuk Mustapa Mohamed. Mustapa said the government is providing a land swap in the project for the centre. "It has been estimated that in 10 years, the whole project would create a GDV (gross development value) of RM15 billion," he told a media briefing after the signing ceremony in Kuala Lumpur yesterday. He said Malaysia currently lags behind neighbouring countries in developing its meeting, incentive, convention and exhibition (MICE) industry, but as a trading nation it needs to enhance export promotion activities. "We have been promoting MICE in the past but we were constrainted from going for large-scale conferences of 5,000 to 10,000 participants due to space limitation." Located along Jalan Duta, the proposed 1 million sq ft centre will be linked to Menara Matrade, and will offer a suitable venue to host major heavy industries and advanced technology exhibitions. It will fulfil demand for ongoing events such as the Defence Services Asia Exhibition and Conference, the Malaysian International Furniture Fair, the Malaysia International Halal Showcase and the International Trade Fair Malaysia. "Built to international standards and specifications with state-of-the-art facilities, it will further strengthen Kuala Lumpur as the choice MICE destination in the region," said Mustapa. Naza TTDI Sdn Bhd chairman SM Nasarudin SM Nasimuddin said several architects, including international ones, are currently bidding for the masterplan to develop the 5.24ha site, which will include hotels and shopping malls. He said the total gross floor area of 1 million sq ft is at par with similar exhibition centres in Thailand and Singapore. Its three floors of exhibition hall will have a column free space of 30m to 60m wide. On financing, he said, it will be internally sourced and tapped from domestic banks. From left: S.M. Nasarudin S.M. 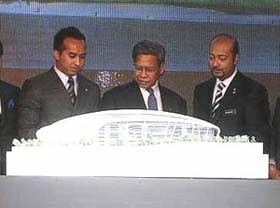 Nasimuddin, Datuk Mustapa Mohamed and Deputy International Trade and Industry Minister Datuk Mukhriz Mahathir viewing a miniture model of the Matrade expo centre. KUALA LUMPUR: Naza Group has entered into a building-for-land deal with the Government which will see it receiving 65 acres of prime land in Kuala Lumpur for building a RM628mil expo centre for Malaysia External Trade Development Corp (Matrade). The centre and other projects planned on the land would have a combined estimated gross development value of RM15bil over a 10-year period, said International Trade and Industry Minister Datuk Mustapa Mohamed. Naza Group joint group executive chairman and Naza TTDI Sdn Bhd chairman S.M. Nasarudin S.M. Nasimuddin said it would embark on a “comprehensive development” on the 65 acres that would surround the expo centre. “We have four international architects bidding for the master plan and it should be finalised in mid-December. “We plan to build shopping malls, hotels and offices,” he said after the agreement signing ceremony yesterday. The site would be leased to Naza for 99 years. Naza TTDI, the property arm of the Naza Group, yesterday signed a privatisation agreement via subsidiary TTDI KL Metropolis Sdn Bhd with the Government and Syarikat Tanah dan Harta Sdn Bhd (a Minister of Finance Inc company) for the land-for-construction swap. Naza TTDI group managing director S.M. Faliq S.M. Nasimuddin said financing for the construction of the expo centre would be via a combination of internal funds and bank borrowings. “We are speaking to a few banks,” he said. Construction of the Matrade expo centre is expected to begin in the second quarter next year for completion in 2014. With a gross floor area of one million sq ft, it will be the largest exhibition and convention centre in Malaysia. The building will have three floors of exhibition space that will house 12 halls. It will be located along Jalan Duta and linked to Menara Matrade. Mustapa said the Matrade expo centre would become an epicentre for meetings, incentives, conventions and exhibitions (MICE) activities. “We depend on trade and MICE is a growing business. We need the right kind of facilities to attract exhibitions and investments into the country. “In terms of facilities, we are still lagging compared with many other countries,” he said. Mustapa said the new centre would be ideal for hosting very-large-scale exhibitions that existing centres in Malaysia could not accommodate. “The centre is expected to fulfil the demand for bigger local and international events such as Defence Services Asia Exhibition and Conference, Malaysia International Halal Showcase and International Trade Malaysia. “This is an important venture to stimulate investments into the country. Hopefully, Malaysia will do a better job in attracting more MICE activities,” he said. KUALA LUMPUR: Naza TTDI Development Sdn Bhd, the property arm of the Naza Group, seems to be getting a very good deal with the building-for-land deal it inked with the Government, several property sources say. Doing some rough calculations, Hall Chadwick Asia Sdn Bhd chairman Kumar Tharmalingam said the RM628mil expo centre it was going to build in exchange for 65 acres (or 2.77 million sq ft) of state land means that it was effectively getting the land for RM226 per sq ft.
“RM628mil is not a lot to pay for a expo/convention centre,” Kumar said. Singaporeans will be presented with Genting Group’s S$6bil convention centre on Sentosa Island in January next year. This will be followed by Las Vegas Sands’ S$5.2bil project on Marina Bay in April. Both of these come with a casino. But convention centre aside, in terms of land cost, the deal has piqued the curiousity of people in the property sector. Sources valued the state land, when converted to commercial land, at between RM350 to RM500 per sq ft.
“RM500 may be a bit on the high side, but it makes sense. The total gross development value (GDV) of all the projects on that 65 acres is going to be RM15bil. That means the market value of that commercial land of 65 acres is RM1.5bil,” Kumar said. A source who declined to be named said at RM500 per sq ft, the land cost would comprise 10% of the total GDV of RM15bil that Naza is undertaking. In Singapore, the land cost can go up to 50% of GDV, in Hong Kong, it is 65% of total GDV. “If it is valued at RM350 per sq ft, the cost of land is about RM970mil. So it is around that range,” Kumar said. On whether it is fair to compare with Singapore and Hong Kong, two countries that have among the highest real-estate prices in the region, the source said it was important to have some sort of yardstick. “Singapore is our neighbour and they are building convention and expo centres too. So are we, with this deal,” the source said. He said several deals comprising land area of between two and three acres were done in the Jalan Ipoh area at RM600-plus per sq ft this year. “Because these are small pieces of land, on a per sq ft basis, the price would be higher. Over in Mont’Kiara, transactions this year were done at between RM200 and RM300 per sq ft,” he said. Naza’s latest trophy, which is one of several, is sited behind Matrade and stretches right up to the government quarters. On a broader scale, that piece of land straddles Mont’Kiara and Segambut on one side and Jalan Duta-Jalan Kuching on the other side. SERI KEMBANGAN: The demand for specialised housing to cater to senior citizens is increasing, thanks to the global ageing population. Gray & Perkins Lawyers, Sydney, partner Bernard Tan said as the ageing population has dependency on fewer children (particularly in China), there are new opportunities to build housing for the senior citizens with age-appropriate features. “According to the source that we have from the United Nations data, one out of 10 persons is now 60 years or above and, by 2050, one out of five will be 60 years or older. By 2150, one out of three will be in this category. “With this in mind, the trend towards building specialised housing for them is increasing,” he told the World Chinese Economic Forum with the theme, Building Business Linkages, Charting New Frontiers, at the Palace of the Golden Horses yesterday. Tan, speaking on the subject, Global Trends in Property - Designing, Branding, Developing Iconic Projects, said such development should provide for “ageing in place” where location to amenities such as meals, hospital and nursing homes and on-site care services were included. “The industry for specialised housing accommodation for older persons in Asia is still at its infancy. While there will be a strong demand for housing, government policies on such development have yet to be determined,” he said. For the Malaysian scene, he said the issue of different cultures and religions needed to be considered and also the role played by the Government. ORIENTAL Interest Bhd, a Penang-based property developer, is looking to expand its landbank to include the east coast and south of Peninsular Malaysia next year, through joint ventures. Its executive director Khaw Eng Peng said the company has been approached by several landowners and may enter into partnership with them for any new projects in Kelantan, Pahang and Johor. "Our plan is to improve our profit margins by building high-end products and adding value to our products," he told reporters after the company's annual shareholders meeting in Penang yesterday. "If the prices are reasonable enough, we will consider expanding our land bank to these places, where we will embark on housing projects," he said. Khaw did not disclose details such as the time-frame for the joint ventures to take off. On the drawing board for next year are eight to nine property launches in Kedah and Selangor, with a combined development value of RM60 million. "Half of the proposed projects will be carried out with joint-venture partners and all will involve residential properties," he said. The projects are located in Kuala Muda and Kulim in Kedah; Sepang; and Seremban. Oriental Interest's undeve-loped landbank now stands at 218ha. Khaw said the company is keen to build high-end housing units, unlike previously where the focus was on low- and medium-cost housing. "To maintain our market and profitability due to our limited land resource, higher materials and development costs, we hope to embark on high-end housing projects," he said, pointing out that it had built high-end bungalows in Sepang. He said unlike in the 1980s and 1990s when demand for affordable homes was high at places like the Kulim Hi-Tech Park in Kedah, the factories operating in the science park are now geared to high-technology operations and do not hire local workers who would be keen to invest in low- or medium-cost homes. Construction and property group Malaysian Resources Corp Bhd (MRCB) has promoted group chief operating officer (COO) Mohamed Razeek Md Hussain Mericar to chief executive officer effective December 1. He replaces Shahril Ridza Ridzuan, 39, who is resigning and will reportedly join the Employees Provident Fund as its new chief investment officer. In a statement issued yesterday, MRCB said Shahril will be stepping down on November 30 after eight years with the group. MRCB chairman Tan Sri Azlan Zainol said Shahril will remain as a board member and contribute to the long-term strategic planning and positioning of the group. Azlan added that in his new role, Mohamed Razeek will be tasked with ensuring MRCB's continued focus on revenue and profit growth and the successful delivery of its ongoing projects. Mohamed Razeek, 51, joined MRCB as the COO in June this year, taking charge of the group's property and engineering and construction divisions. He has over 26 years experience in property development projects, including integrated commercial and residential as well as township developments in Malaysia and internationally. Meanwhile, the group reported a net profit of over RM10 million in the third quarter ended September 2009 compared with a net loss of RM26.8 million in the comparable quarter a year ago. Revenue increased to RM257.1 million from RM179.3 million in the previous corresponding period. The group said the return to profitability was mainly contributed by better profit margins from the completion of existing projects and the consistent recognition of profit from the group's ongoing work progress. SINGAPORE: Singapore's CapitaLand will raise US$1.8 billion (US$1 = RM3.37) from listing its shopping malls unit, drawing strong investor interest for an offer that was modestly priced after some Asian IPOs faltered recently due to valuation concerns. The CapitaMalls IPO will be the biggest in the city-state in 16 years. It follows Maxis's US$3.3 billion IPO in Malaysia, Southeast Asia's biggest IPO ever, as Asian companies rush to take advantage of recovering stock markets. The CapitaMalls Asia offering was priced at S$2.12 (S$1 = RM2.43) a share, according to an issue prospectus, below the midpoint of an indicative range of S$1.98-S$2.39 a share. The shares will now be offered to retail investors and start trading on November 25. CapitaLand will make a one-time gain of S$883 million, or about 23 Singapore cents a share, from selling the 30 percent stake in the business, and the firm said it may give shareholders a special dividend. Asia has been a hotspot for IPOs this year, led by multi-billion dollar deals in China, but some newly listed companies such as China Merchants Securities, Glorious Property Holdings and Australian department store chain Myer Holdings have had poor debuts, raising concerns about valuations. Merchants Securities made a weak debut in Shanghai yesterday, closing up only 8.4 per cent from its IPO price - the worst debut performance for a newly listed stock on the mainland since a ban on IPOs was lifted. The conservative pricing for CapitaMalls is aimed at ensuring the share trades well after it debuts on the stock market on November 25, said a source. "The book was very well covered from long-only investors," said the source, adding US and European investors participated heavily in the IPO. "This IPO could have been priced higher, but the aim was not to squeeze investors." CapitaLand is selling 1.165 billion shares in CapitaMalls Asia to raise S$2.47 billion, making it Singapore's second-biggest IPO behind the Singapore Telecommunications offering that raised S$4 billion in 1993. JPMorgan is the sole financial adviser, and issue manager with DBS. The two banks are also bookrunners with Deutsche Bank and Credit Suisse, according to the prospectus. CapitaMalls manages and has interests in 86 retail properties worth S$14.4 billion in Singapore, China, Malaysia, Japan and India. CapitaLand suspended its shares for trading early yesterday, but ended 2.4 per cent lower by close of trade as traders had expected the IPO would price higher. Besides increasing its dividend, CapitaLand, which is 40 per cent owned by Singapore wealth fund Temasek, may also use the proceeds to invest in residential and other projects such as hospitality, some analysts said. BRAMPTON Holdings Sdn Bhd, the property division of Fraser & Neave (F&N) Holdings Bhd, will lease out 800 units of shops under the RM350 million Fraser Business Park Phase 2, which will be completed by January 2010. The group is negotiating with some 300 potential tenants that are interested to rent out its information and communication technology (ICT) space, which has a dedicated 500 shop lots. The 2.43ha Fraser Business Park Phase 2 located in Jalan Yew, Kuala Lumpur, comprises 400,000 sq ft of retail entertainment space, a 70,000 sq ft hypermarket, food court and other food outlets. PETALING JAYA: Glomac Bhd’s wholly-owned subsidiary, Glomac Damansara Sdn Bhd has entered into a sale and purchase agreement with Lembaga Tabung Haji for the disposal of a 25-storey office block for RM170.7mil. In a filing with Bursa Malaysia yesterday, Glomac said the property would be completed and handed over to Lembaga Tabung Haji within 36 months from the date of the building plan approval. The development order was obtained on Sept 24. “The proposed sale will enhance Glomac’s future earnings and substantially reduce Glomac’s working capital requirements for the development of this project,” it said. GLOMAC Bhd’s wholly- owned subsidiary, Glomac Damansara Sdn Bhd has signed a sale and purchase agreement with Lembaga Tabung Haji for the sale of Tower D at its Glomac Damansara development, for RM170.73 million. Glomac said the proposed sale will immediately enhance the group’s future earnings and substantially reduce its working capital requirements for the project. “The en-bloc sale to financially-strong institutions such as Lembaga Tabung Haji is part of Glomac’s strategy to reduce sales risk for new projects,” it said. KUALA LUMPUR: TA Enterprise Bhd, a member of the TA Group, expects a three-fold increase in revenue contribution from its hospitality operations next year. Its managing director and chief executive officer, Datin Alicia Tiah said this follows an additional hotel portfolio acquisition this year. The company's 2009 Annual Report showed that the hotel division contributed RM76 million for the financial year ended Jan 31, 2009. "We hope to see this more than triple in future," she told reporters after the company's extraordinary general meeting (EGM) here on Wednesday. Tiah said the company was confident that the outlook for continued growth in the hospitality market is very positive and in tandem with the better global economic outlook. Meanwhile, she said the new acquisition, the RM635.805 million four-star Swissotel Merchant Court hotel in Singapore, was part of TA Enterprise's plan to enhance its hospitality operations. According to Tiah, the property and brokerage company has also set aside S$5 million (S$1.00=RM2.44) to refurbish the newly acquired hotel. She said the amount budgeted is for the next five years to upgrade the hotel's public areas, back of house areas and meeting facilities. "The budgeted capital expenditure has taken into consideration the pricing of the hotel," she added. The purchase of the hotel involves the acquisition of 50,569,495 ordinary shares of US$1 each in Quayside Gem Ltd (QGL), representing 100 per cent of the issued and paid-up share capital of the company from a real estate investment fund, LaSalle Asia Opportunity II SARL. "We believe that Swissotel will provide a steady revenue stream to the hospitality operations of the TA Group," she said. Tiah explained that the company planned to transfer Swissotel over to TA Global for better synergistic management, since all the existing hotel properties of the TA Group is held under that company. Currently, TA Group through TA Global owns three other hotels, including the Radisson Plaza Hotel Sydney and Westin Melbourne in Australia as well as the Aava Whistler, Canada. Tiah said the company also hoped to complete one other acquisition this year. She, however, declined to elaborate further on this, stating that it would continue eyeing commercial buildings, hotels and land in the country and overseas.